Have a question about Millboard? Below are 18 answers to the most popular questions we get asked about Millboard. Millboard is a low-maintenance, high-performance and wood-free alternative to timber decking. Read more here. Why choose Millboard over timber decking? Millboard brings you the beauty of natural timber, with less maintenance. Unlike timber decking, Millboard is solid and therefore does not expand or contract, or rot and warp like wood or wood composite. Millboard is also coated in Lastane, making it resilient against stains and scratching and able to withstand the elements. Millboard is a Polymer Composite, also known as FRP (Fibre Reinforced Polymer). The core materials are polymer-based resin and a variety of fibres including glass, carbon and natural fibres are used for reinforcement. The top layer is made from Lastane. Lastane is the resilient top layer of the Millboard which is stain and scratch resistant and provides durability that can withstand the elements come rain or shine. The Lastane coating makes Millboard algae-repellent, providing a virtually maintenance-free surface. Does Millboard look like real wood? Yes. 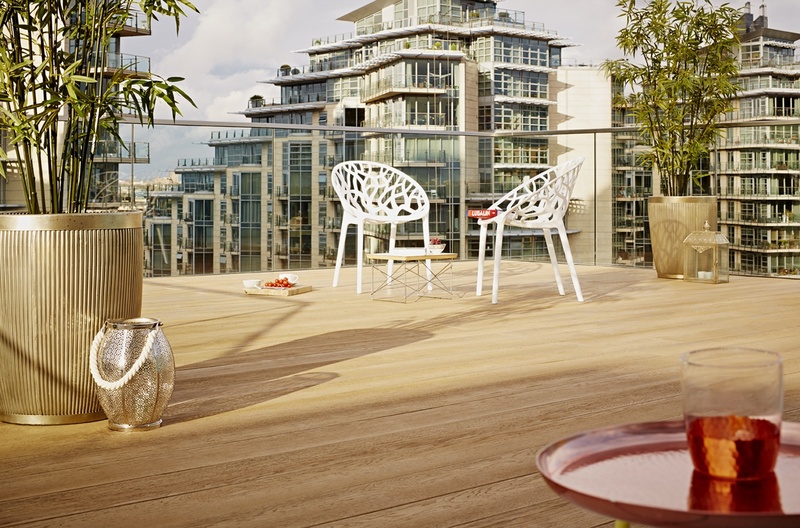 Millboard is moulded on the highest quality timber to achieve a beautiful real-wood look. Their Weathered collection was moulded on a 100-year-old oak which originated from the floor of a French railway carriage. Millboard is designed and made in Great Britain. Many of the processes that take place to make Millboard are carried out by hand to ensure the quality of the detail in each board. Like Elliotts, Millboard is also a family owned company. Yes, Millboard can be cut just like normal timber decking. It is recommended that you use a carbon-tipped, multi-purposed chop saw although normal saw blades are also fine. Do I need to treat Millboard? No, all Millboards are sealed before they leave the factory and are resistant to rot and algae so no future treatment is needed. If I choose a coloured Millboard, will it fade over time? Millboard has been designed with a tough Lastane layer which is then hand coloured with UV stable pigments for long-lasting beauty. Why does surface water sit on my Millboard? This is normal for the first few weeks of use, but don’t worry, this is only until the temporary surface seal breaks down. Is Millboard safe when wet? Millboard has one of the highest anti-slip ratings, even in wet conditions. However, still take caution as usual. What happens if it snows or is icy? Millboard recommend just using a small amount of granulated white salt to keep ice at bay. Do not use rock salt as this can be abrasive. When the cold weather has passed, just use soapy water and a soft broom to clean the surface. Can hot weather affect Millboard? Millboard is UV-proof and has been designed to retain its colour. And as it’s not real wood, it won’t expand in the heat. But just like the rest of us, it can get hot in high temperatures. So if we’re having a British heatwave, you may want to wear footwear on the Millboard decking. Plus, the boards shouldn’t be installed in any areas that are affected by heat-reflective glass. How do I install Millboard? Do you need any special fixings for Millboard? We recommend the Durafix screws designed specifically for Millboard. No pre-drilling is needed and the Lastane that forms the top layer of Millboards can “self-heal”, leaving a virtually unnoticeable mark. Read more about Durafix screws here. Yes. A 25 Year Residential limited warranty and a 5 Year commercial warranty gives you peace of mind against the boards splitting and twisting, and against mildew and fungal decay. You must register your purchase within 90 days via the Millboard website. You can do this, and read the terms of the guarantee, here. Millboard is stocked in our Romsey, Ringwood and Bishop's Waltham branches. We’ll deliver to your local branch or direct to site. Just get in touch with details of your project and we’ll provide you with a no-obligation quotation. Contact your local branch today. We’ve covered off our top Millboard questions, but if yours wasn’t answered, just get in touch using the contact form.